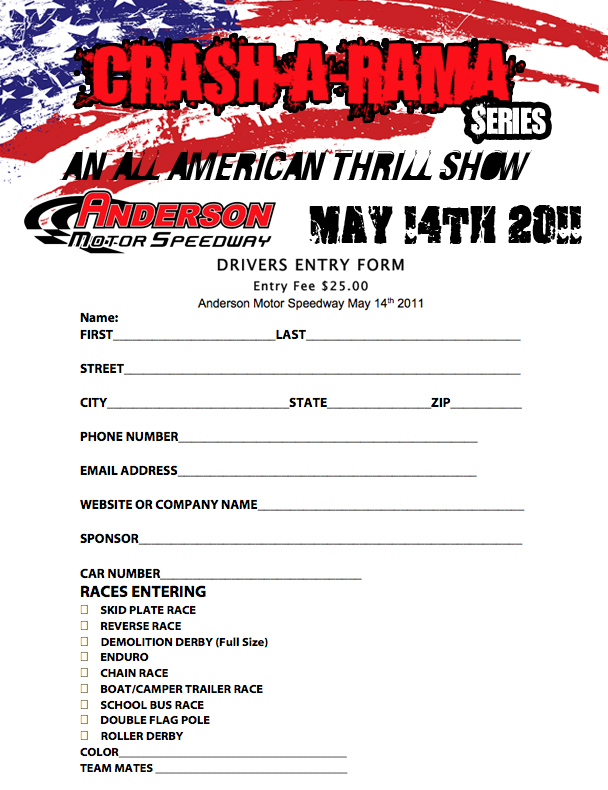 We have posted the Anderson Motor Speedway May 14th 2011 Drivers entry form. You can download it by clicking HERE. You can also print the entry form in color by clicking HERE. Print out as many forms as you like and give them to other people intrested in being a part of our event. All drivers are welcome to join us in a crashing and smashing good time! All you can race pass includes enduro and demolition derby is only $25 plus pit pass fee. Any questions or comments please feel free to call or email us. Thank you and hope to see you May 14th! Newer PostWIN ADVANCED "FAST FIVE" TICKETS !